Do you like scary movies? If you do, keep on coming, have we a doozy for you today. One of the simpler mechanics as far as games go. There are two types of ranged weapons, a teapot cannon and a pepper grinder. The melee weapons include a hobbyhorse to smash blocks and blockades, and a butcher knife they call “the vorpal blade.” Alice can upgrade these with teeth found throughout the game. Yikes, this was tough at times. This required a level of strategy I haven’t had to use since the Batman Arkham games. There is an assortment of creatures as adversaries along the way. By the end, I was taking on half a dozen assailants or more at a time, all of which of various and sundry types, needing to be taken out in a variety of ways. It was a trying, but rewarding effort. 7/10. A good game, but I wouldn’t give it to anyone but a gamer who really, really likes his platforming puzzles. 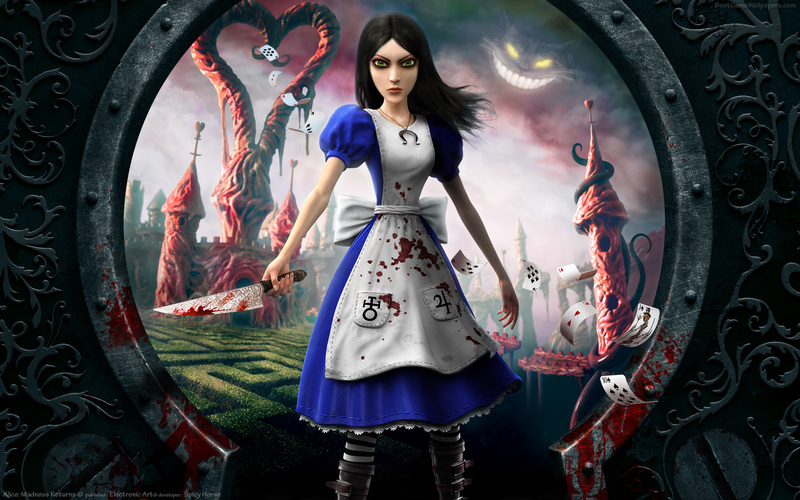 This entry was posted in Fantasy, Fiction, Gaming, Reviews, Video Games and tagged Alice in Wonderland, Alice: Madness Returns, Lovecraftian, Steampunk. Bookmark the permalink.